While most of the world seems to use Jeppesen, I’ve been exclusively using LIDO now (across two airlines) for perhaps 10 years. While it took some getting used to, I’ve come to much prefer them. As an information junkie, I like the amount of information that is hidden away in plain sight right in front of you, if only you look through the Legends and Tables (LAT) section for the decode of all the intricate colors and symbols. But as with everything new – it’s a process of discovery and once again I’ve been taken by surprise by something that seems unique to LIDO. Being European, they’re based on JAR and one aspect that has come to light recently is the visibility requirement required to commence an non-precision approach. I’ve always operated on the assumption that if the reported visibility at the bottom of the approach meets the needs promulgated on the approach plate – I’d have a fair chance of landing off the approach. As it turns out – this is not the case for NPA based on JAR OPS compliant minimas. 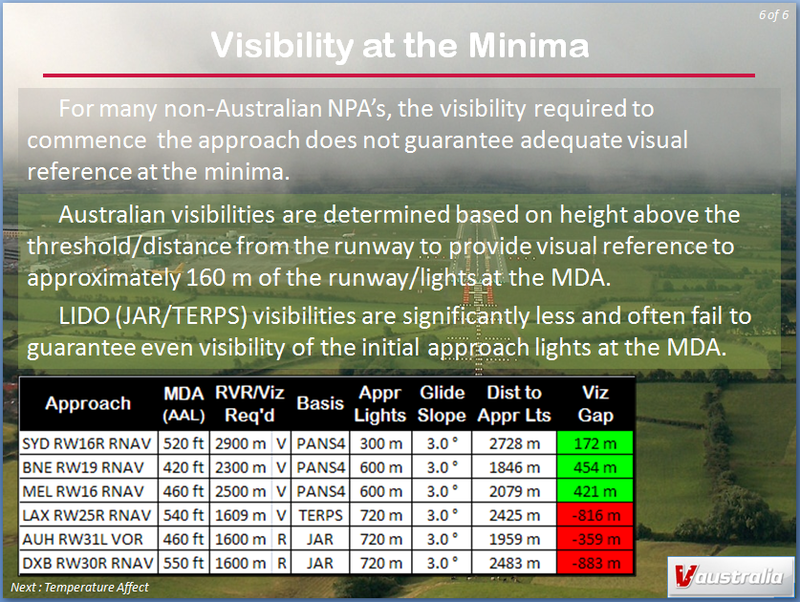 Almost without exception – if the visibility at the bottom of the approach matches the chart, you’ll not have the visibility to see either the approach lights, or (in their absence) the runway. Interestingly the minima’s published in LIDO charts against Australia approaches (which are are still PANS OPS 4 based) reflect the higher visibility requirements, and in all cases you can see the lights/runway. I’ve spent some weeks chasing this down through friends overseas in teaching organisations in the Uk. Without exception, they’re surprised by discrepancy and unable to explain it. At this point, I guess all that remains is to document it so that crew are aware that off the bottom of a JAR NPA – they may not have the visual reference to safely continue the approach to the runway. The table below compares some of our Australia NPA’s against their JAR equivalents – the issues are obvious. 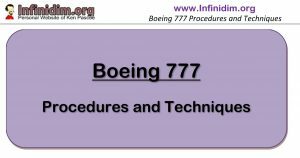 The visibility required to commence a non-precision approach does not guarantee sufficient visual reference at the minima to continue to a landing. This is particularly the case for NPA’s based on JAR/TERPS. Given that the crew will disconnect the AP and manoeuvre visually from the MDA to the runway, crew should ensure that adequate visual reference exists to do so at the MDA.